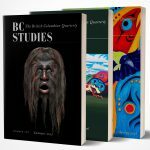 This double issue commemorates Douglas L. Cole, a noted British Columbian cultural historian, best known for his groundbreaking 1985 book Captured Heritage: The Scramble for Northwest Coast Artifacts and for his documentation of the lives of collectors of ethnological artifacts, and will appeal to anthropologists, historians, art historians, museum scholars and First Nations people alike. Judith Berman is a research associate at the University of Pennsylvania Museum of Archaeology and Anthropology in Philadelphia. Her dissertation, “The Seals’ Sleeping Cave: The Interpretation of Boas’ Kwak’wala Texts,” as well as a number of her publications examine aspects of the Kwak’wala language, the Kwakwaka’wakw research of Franz Boas and George Hunt, and the interpretation of the Boas-Hunt texts. Regna Darnell is professor of anthropology and director of the Centre for Research and Teaching of Canadian Native Languages at the University of Western Ontario. She is currently Bicentennial Visiting Professor of Canadian Studies and Anthropology at Yale University. Among her recent publications are the following: Edward Sapir: Linguist, Anthropologist, Humanist (University of California Press 1990); And Along Came Boas: Continuity and Revolution in Americanist Anthropology (John Benjamins 1998); Theorizing the Americanist Tradition (ed. with Lisa Valentine) (University of Toronto Press 1999); and Invisible Genealogies: A History of Americanist Anthropology (University of Nebraska Press, in press). She is a fellow of the Royal Society of Canada. Gloria Jean Frank (Ahousat First Nations, Nuu-chah-nulth) is in the MA Programme in history at the University of Victoria where she is pursuing an interest in the oral history of her community. In May 1997, she participated with Douglas Cole in a special plenary session, “Reading Ethnographic Texts,” at the BC Studies Conference hosted by Malaspina College, Nanaimo. Her paper for this session was entitled, “‘Ego vero,’ inquit ‘pudenda ejus olfacio’: Censoring the ‘Lewd’ and ‘Crude’ in First Nations Legends.” In addition to her graduate studies, she is currently teaching in the ABE Programme, North Island College at Ahousat. Heather Gleboff is a student in the MA Programme in history at the University of Victoria. She is the recipient of numerous scholarships, including a University of Victoria fellowship, the Hendrickson Prize in BC History and the University of Victoria Alumni Association Graduate Award. Ira Jacknis has served since 1991 as Associate Research Anthropologist at the Phoebe Hearst Museum of Anthropology, University of California, Berkeley. In early 2001, the Smithsonian Institution Press will publish The Storage Box of Tradition: Museums, Anthropologists, and Kwakiutl Art, 1881-1981, a revision of his doctoral dissertation (Anthropology, University of Chicago, 1989). His specialties include the art and culture of the Native peoples of Western North America, and the history of anthropological film, photography, and museums. the Victoria Telecommunity Network in 1992, Canada’s first free Internet service provider, and continues to help maintain its Web site. He co-sponsors the annual British Columbia History Web Site Prize with the BC Historical Federation. His personal Web site is at http://members.home.net/dmattison. Nusqimata (Jacinda Mack) is completing a BA in anthropology at the University of Victoria. A member of the Nuxalk and Secwepemc First Nations, she is the recipient of the 2000 BC Rail Aboriginal Scholarship and numerous bursaries. She is also a former high school exchange student who studied in Lisbon, Portugal, in 1992-1993. The mother of three-year-old Kamalsoncw Sacomlic (Orden Mack), she plans to do graduate work on First Nations environmental issues. Wendy Wickwire is an associate professor in the Department of History and School of Environmental Studies at the University of Victoria. Among her publications are Write It On Your Heart: In the Epic World of an Okanagan Storyteller (Theytus, 1989), Nature Power: In the Spirit of an Okanagan Storyteller (with Harry Robinson) (Douglas & McIntyre, 1992), and Stein: The Way of the River (with Michael M’Gonigle) (Talonbooks, 1988). Her research interests include the oral traditions of the First Nations peoples of south central British Columbia and the history of anthropology in British Columbia, especially the work of James A. Teit.